According to the World Steel Association, apparent steel use in the US decreased 0.6% in 2013 after solid growth in 2012, due mainly to lags in both residential and commercial construction. In 2013, US crude steel production decreased 2%, to 87 million tons. However, in 2014 and 2015 growth is expected to return, with apparent steel use expected to increase 4% (to 99.4 million tons) in 2014 and 3.7% in 2015. Overall, income statements and balance sheets have become more stable. Liquidity is improving and debts are being reduced more significantly than in past financial years (in the US the financial year runs from 1 October to 30 September). Operating and net margins of steel and metals businesses remained tight last year, averaging 2%-4% and 1%-3% respectively. However, those margins are considered positive, as most companies are reporting lower revenues for the 2013 business year. Cash from operations and free cash flow overall have both improved and are mostly positive, especially at the operational level. This has allowed companies to continue paying off more debt and reduce their reliance on revolving credit lines. Most debt-to-equity ratios are now between 0.8-to-1 and 1-to-1, compared to 1.5-1 six years ago. While dependence on bank finance remains high, we currently see no signs that banks are unwilling to provide credit to the sector and, in fact, are renewing credit facilities for up to five years. 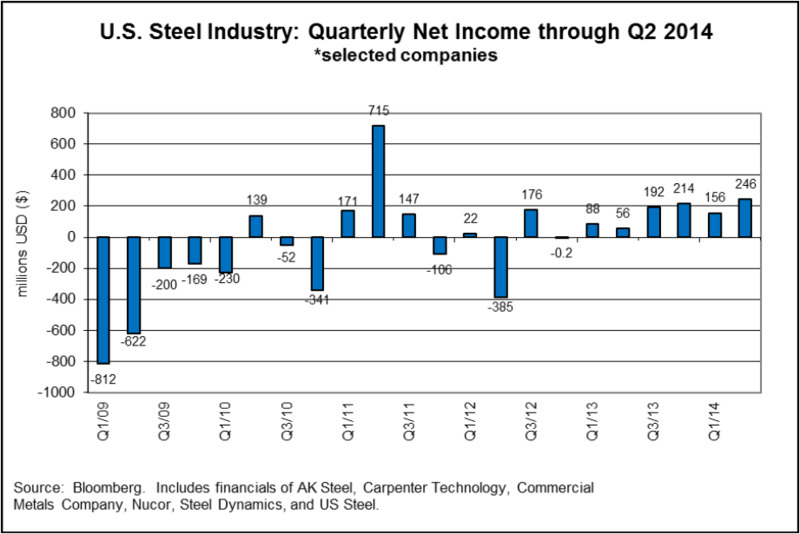 Some consolidation is starting to take place in the US steel sector. Russian steel company Severstal, which sold three of its five units in the US in 2011, has just agreed to sell their remaining two units to US companies by the end of this year. Companies continue to seek business outside their normal areas, either on a regional or national level. Sequestration by the federal government had a major impact on business planning and production in 2013: while budgets have recently been confirmed for the 2014-2015 fiscal year, there have been several reports of Defence Department contractors reducing their workforce in 2014 due to the fewer government contracts now available. In the steel sector, average accounts receivable and accounts payable turnovers are being maintained in the 40-45 day range, with inventory turns averaging between 60-75 days. Except for potential one-off insolvency issues, there has been no increase in payment delays since the beginning of 2014 and we do not expect any major increase in the coming 12 months. Customers continue to buy primarily on a ’just-in-time’ basis, which positions them better for controlling costs in a tight economic market. We continue to see a squeeze on pricing and volume in the US steel sector. On average, businesses are still showing lower revenues and both operating and net profits. However, there is strong evidence that companies are being properly managed in a tighter business environment and that decreasing prices and revenues are more the result of a competitive marketplace than economic difficulties. While we expect US business insolvencies to decrease 5% in 2014, our forecast is for steel/metal insolvencies to simply level off. We are seeing a slightly higher trend of larger companies making strategic acquisitions of smaller marginal companies, thus saving smaller companies from insolvency. We continue to be cautious in our underwriting approach for this sector, primarily where requests for credit insurance cover are significantly out-of-scale with a buyer’s apparent operational requirements. 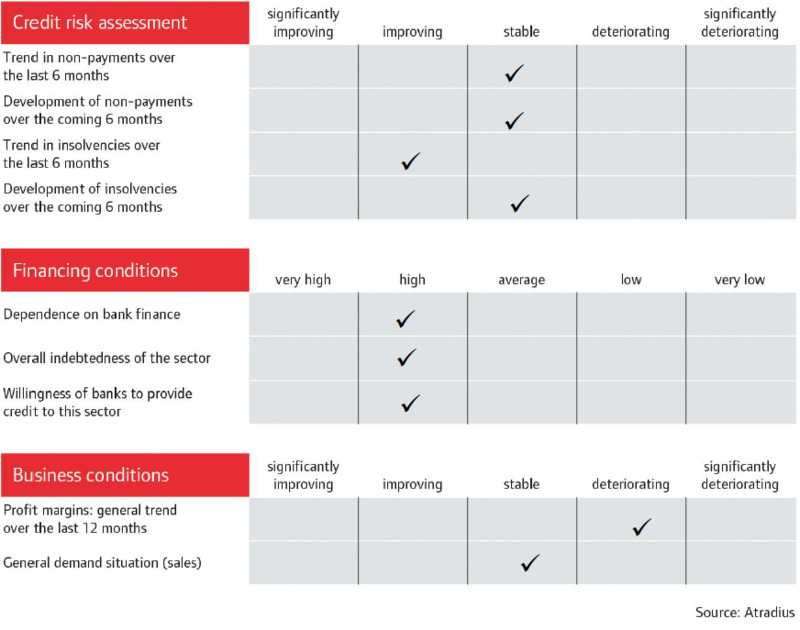 However, as positive payment trends continue, even for SMEs, we will consider higher credit approval for buyers with long-term positive payment, financial and operational histories. When assessing credit limit applications, we continue to review audited financial information. But another decisive factor is the buyer’s payment history with businesses other than our applicant. On smaller and/or privately held companies, where financial information is not available, we look at the company’s years in business, both under a corporate and family structure, its recent payment history, high debts and any legal issues. We also continue to take into consideration the length of time that our customer has been doing business with a buyer and the credit controls and procedures that the customer has in place. So that we can maximise the cover provided to our customers on buyers in the metals/steel sector we review each buyer individually and make decisions based on all available information. This includes consideration of bank or parental securities, limiting the exposure to a specific project or time frame or approving as much cover as possible under the limit capacities.